ONCE upon a time, the act of picking up a six-pack on the way home was a relatively simple task. The choice was mostly one of light, mid or heavy lagers from one of the major brewers, with some South Australian or Tasmanian premium lines available for those who were of an experimental bent. Different story today. Pale ale, India pale ale, American pale ale, Australian pale ale, New World pale ale, Golden ale, Summer ale, gluten-free pale ale and organic pale ale - and that is just some of the range in one aisle of my local bottleo - so where do we start? There is, however, some help at hand. We are used to seeing alcohol contents expressed as an alcohol by volume percentage or as a number of standard drinks per bottle when deciding how many of what to take to a session with friends. But there is another rating that, once you get used to it, can be really helpful - the International Bitterness Unit or IBU. Hugh the Neighbour and I cottoned on to this in about the middle of last year when we finally admitted to one another that neither of us had any idea what IBU meant, and so availed ourselves of Dr Google to rectify this gap in our education. IBU indicates the relative bitterness of a beer as measured by the amount of isohumulone (which is the bitter bit of hops) in parts per million. Put simply, the bigger the IBU number the more the hops is going to whack you in the mouth. 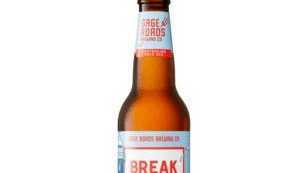 This was apparent when HTN and I were trying the Gage Road Break Water Australian Pale Ale. A pleasant enough drop, it is an unfiltered lighter style, boasting an IBU of 15, and sure enough it had a hint of bitterness behind a rounded maltiness. We contrasted this to the Little Dove New World-style pale ale, which, with an IBU of 48 delivers the punch of hoppiness expected from an American-style pale ale. So while this isn't going to tell you whether it is going to taste any good, or keep a head in the glass, or whether it will give you a splitting headache the next day despite only having a couple (I am looking at you Crown Lager), it does take some of the guesswork out of trying a new brew. The Break Water is worth a try too. Just remember, IBU 15.